Powercast‘s chief inventor and CEO John Shearer is pitching manufacturers on a wireless vision: a world where gadgets and devices are powered and charged without all the hassle of wires. The Powercast Wireless Power Platform includes a Power Caster and a Power Harvester. The Power Harvesters are attached to something like an iPod or cell phone and can draw power from Power Casters by bringing the device within close proximity. 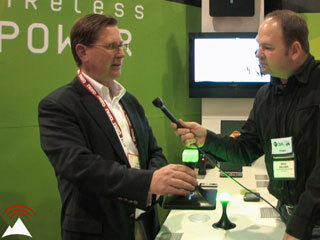 Powercast was shown off at CES 2007 and now in 2008 they have added more wattage. Hopefully for those of us who hate packing chargers and attaching wires, Powercast will find partners that can leverage their platform.